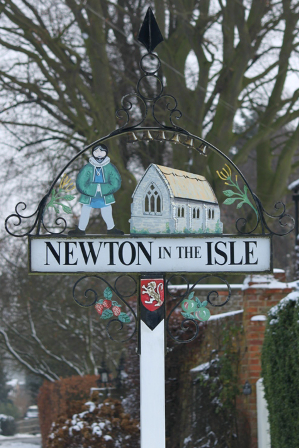 The figure on the sign is of Sir John Colvile, the most famous of the villagers, who were the lords of the manor of Newton since the time of the Norman Conquest. Sir John fought at the Battle of Agincourt with King Henry. He founded the college or chantry called the Chapel of St Mary in the Marsh or 'Capella Myis' in 1403 and endowed it with £40 per annum to maintain four chaplains, four clerks and ten poor men. The college depicted on the sign stood on the old Roman bank near to the old rectory. Strange to think the sea came so close. The white lion rampant has been part of the Colvile coat of arms since 1280. The six bells denote the six bells on St James' parish church, built in the 13th century. On the right hand side of the sign there is a woad plant. Woad was grown to the end of the 19th century in Newton and was probably pressed in the woad mill at Parson Drove. In the present day, one local pub is called the Woadman's Arms and the other the White Lion. The latter has the lion rampant as its sign. This information is taken from The Cambridgeshire Village Book, written by members of the Cambridgeshire Federation of Women's Institutes and published by Countryside Books. The book was first published in 1989, when the White Lion pub was still open.